Da Capo Press, 9780306819186, 400pp. 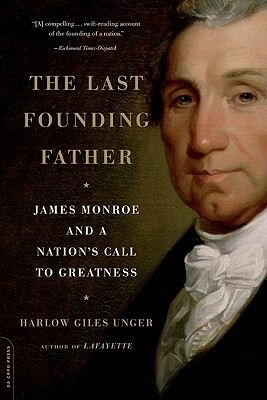 In this compelling biography, award-winning author Harlow Giles Unger reveals the epic story of James Monroe (1758-1831)-the last of America's Founding Fathers-who transformed a small, fragile nation beset by enemies into a powerful empire stretching "from sea to shining sea." Like David McCullough's John Adams and Jon Meacham's American Lion, The Last Founding Father is both a superb read and stellar scholarship-action-filled history in the grand tradition. Acclaimed historian Harlow Giles Unger is a former Distinguished Visiting Fellow at George Washington's Mount Vernon. Named one of the nation's premier presidential biographers for his biography of James Monroe (The Last Founding Father), Unger is the author of twenty-four books, including eleven biographies of America's Founders and three histories of the early republic. Marquis de Lafayette, a comrade in arms and a dear lifelong friend." --John P.